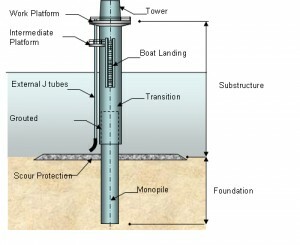 The most common type of foundation for an offshore turbine is called a monopile. 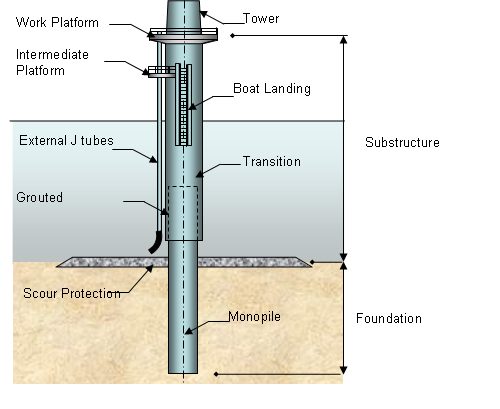 It is simply a vertical pole that is driven deep into the earth beneath the turbine. This process requires the use of huge pneumatic hammers, sometimes with the addition of drills. The noise created during pile driving can carry up to 80km. Studies show that dolphins less than 100m away from the pile driving can suffer auditory harm and most exhibit behavioral changes to avoid a 50km radius around the pile (Bailey). These effects can be extrapolated to other cetations, which could drive them away from prosperous habitats. Noise during operation is another one of the many concerns associated with offshore wind energy installations. Marine mammals such as porpoises and harbor seals are at the forefront of the concern because they use sound to communicate with one another. After some research though, scientists have found that the impact of the turbines may become minimal once the animals are far enough away from the foundation. It was discovered that audibility for porpoises is very low 20-70 meters from the foundation of the turbine. 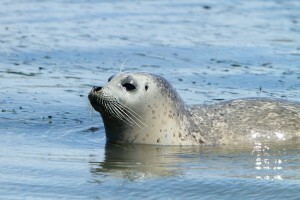 For harbor seals audibility may range from 100 meters up to several kilometers. Overall though, these are not very large regions in relation to the vast size of the ocean (Tougaard). For more information on the acoustic effects on marine mammals click here. Marine mammals are not the only marine animals that are impacted by the noise produced by offshore wind installations. For information about how noise from these installations may affect fish click here. For information about how noise from these installations may affect cephalopods click here.